Alan Wake is an action-adventure video game developed by Remedy Entertainment and published by Microsoft Studios, released for the Xbox 360 and Microsoft Windows. 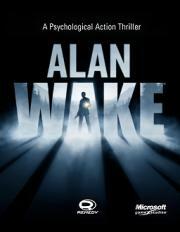 The story follows best-selling thriller novelist Alan Wake, as he tries to uncover the mystery behind his wife's disappearance during a vacation in the small fictional town of Bright Falls, Washington, all while experiencing events from the plot in his latest novel, which he cannot remember writing, coming to life. As a Twin Peaks fan I really wanted to like this game. This game does not deserve to be liked, though. Rarely have I screamed in frustration over any other game beside the Soulsborne games in my adult years, but this one triggers me within the first 3 hours, and it's due to very poor gameplay design, not difficulty. The game is also beautiful in daylight, but most of it takes place during the dark. Such a wasted opportunity. The story was even kiiiiinda promising, but also very predictable. A writer struggling with his own mind- the concept seems neat to investigate, but really, I felt like the journey was empty. I didn't feel like anything was resolved. As much as I enjoyed playing through this interesting take on third person horror, I can't give it more than a 75. An interesting story, broken up into an almost cringey 'episodic' format with chapters broken up into episodes that recap exactly what you've already seen if you're playing from one chapter to the next continuously. Gameplay, whilst it can be quite frantic, boils down to aim light then shoot. The headshots are satisfying at least. The legitimately haunting atmosphere went out the window once I reached the "possessed harvester" boss level. But great story. A narrative masterpiece that plays like a great Dean Koontz or Stephen King novel. Solid, although at times repetitive gameplay combined with compelling characters and storytelling. A very engaging Stephen King pastiche. The controls are inelegant but they're worth wrestling with for everything else the game has to offer. Game design and story are great. Some goofy mechanics aside, it's a good play.